Last Friday, The Huntsman: Winter’s War came out and was declared so bad that it’s good again. How did it turn out this way? Too campy? Too stupid? Too prequel-y? “But wait!” (I hear you cry) “It’s not just a prequel! It’s a sequel, too!” Why yes, it is. For there are worse things out there than prequels, my friends. Way worse. This is a film that takes place before the previous film and after. How? Perhaps some judicious use of time skips or flashbacks. 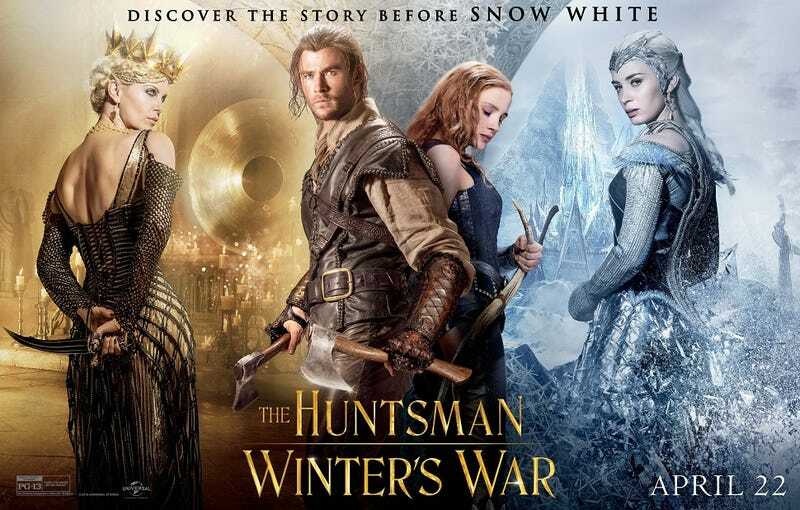 Although this can result in some weird bits of continuity, things will contradict the original film — like the fact that The Huntsman: Winter’s War doesn’t include Snow White, who, you know, was the Huntsman’s love interest in the first film. Snow White and the Huntsman ended with Snow White and the Huntsman going to live their life together...but apparently, that just didn’t work out at all, because the Huntsman goes back to his dead wife seven years later. Other movies include: 300: Rise of an Empire, which takes place before, during, and after the original 300. This is a film that takes place during the previous film, but seen from a different perspective. Sometimes they can be interesting and...sometimes they can be not. If they decide to play around with conventions and actually make something good, it can turn out like Rosencrantz and Guildenstern Are Dead, a play which takes place during Hamlet but stars two side characters that pretty much nobody cares about. So you’ve had the original film and then you’ve had the sequel. You want to make another one, but you don’t want to set it after the second film. Make a prequel to the first? Nah, you don’t want to do that either. I know! Made a movie set between the first and second movies! An interquel! Actually, most of The Fast and the Furious increasingly bizarrely named sequels have been interquels: Fast and Furious, Fast Five, and Fast and Furious 6 all take place before the third movie, The Fast and the Furious: Tokyo Drift. And hey, those movies are all entertaining, right? Also, I’m pretty sure Rogue One is an interquel. I mean, it takes place after the prequels, but before the main trilogy. Or would that just make it a prequel? Wait, I’m confused. The film takes place before the original film. Or maybe not. Or maybe it takes place after. Or during. Or...wait hold on, let me get my notes. Okay, no, I got this, it takes place after during the before when the main character wasn’t there, but then there was...hold on, no, wait. Examples include Primer, which was a hemidemisemiquel to Prime, a movie where they didn’t invent time travel and it was just a normal boring day. Does it...take place in the same universe? Are we in a separate universe? Is this...what? I don’t understand. My head hurts. Are we dead now? ...I’m sorry, that was unprofessional of me. I’m just going to sit here and rock back and forth now.